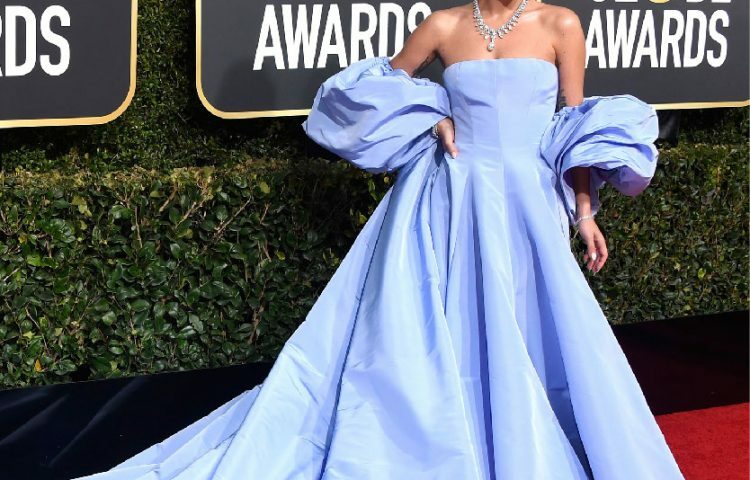 With the year coming to a close, it’s time to reflect on the jewellery trends that emerged, inspired, and wowed us in 2018. 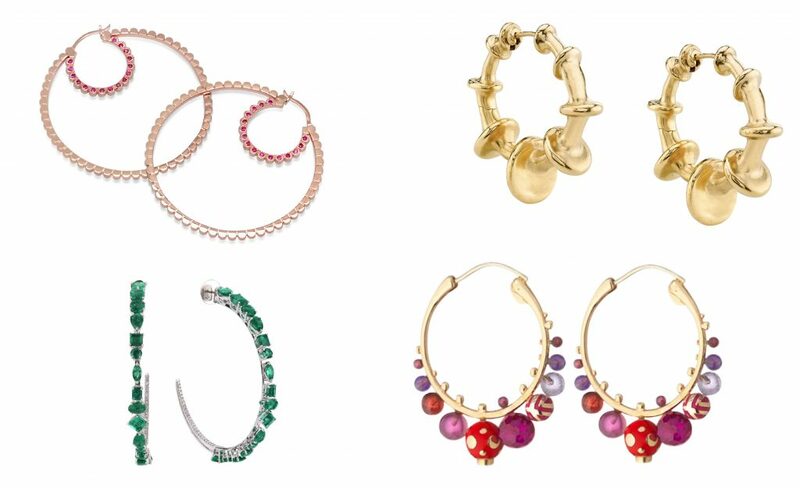 From statement earrings to animal motifs, designers and jewellers went all out with fun, playful, and standout designs this year. 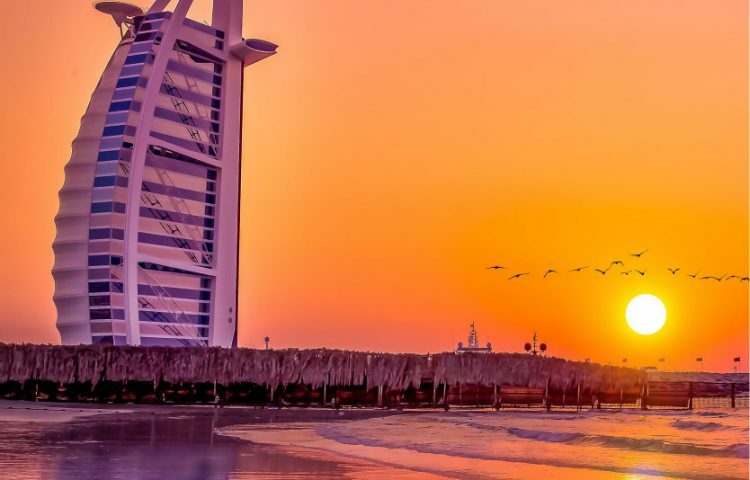 Here are five of our favourite trends. Inspirations from the wild are taken to bolder realms. Designers have let their imagination run wild: animals, sea creatures, and mythical beings feature a confident mix of precious metals and gemstones. Palmiero Jewellery Design’s Curious Parrot necklace stuns in white and coloured diamonds and sapphires in 18K white gold. The graceful curve of the gem-studded parrot just sits nicely on the chest, making the high jewellery piece a delight to wear. Hand-carved rock crystal fish motifs feature prominently in Loren Nicole’s Silla fish necklace and charms inspired by the ancient Korean Kingdom of Silla, which she discovered while working as a conservator at the Metropolitan Museum of Art. 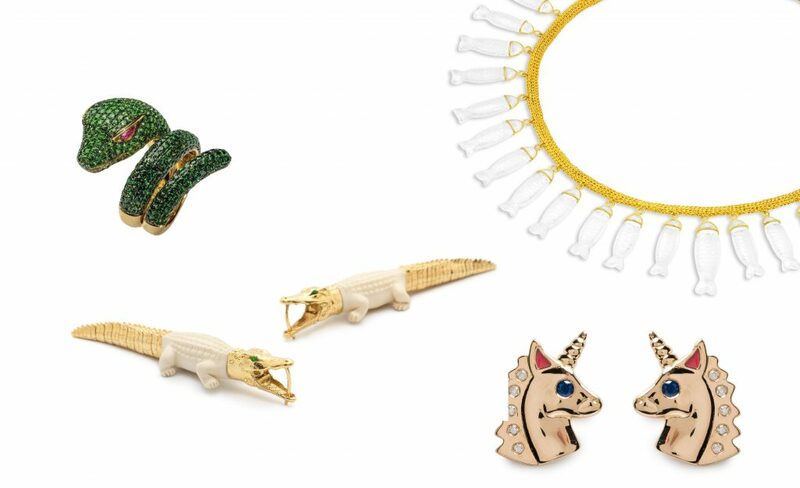 Miniature alligators with movable tails, realised in gold and mammoth tusk, by Bibi van der Velden, and cute gold unicorns with pink enamel ears from Brent Neale’s After The Rain collection are equally charming. 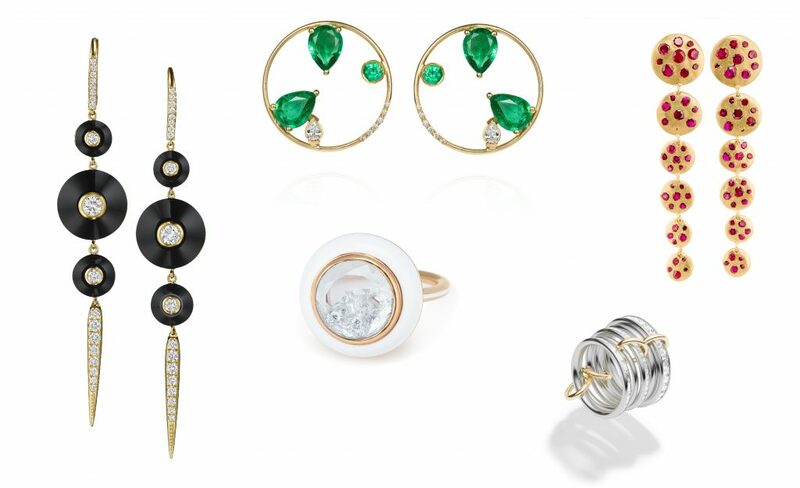 These bold must-haves will effortlessly segue into 2019 with fine and high jewellery styles getting bigger, bolder, and brighter. Coloured gems, diamonds, pearls, and semiprecious stones are made interesting with unique textures and detachable elements. Focusing on the transformable style, Neha Dani’s delightful Brassica earrings unfurl into a ruffled petal waltz. Crafted in rose gold and set with natural fancy pink diamonds and white diamonds, the articulated drops are removable and can be worn as a pendant. 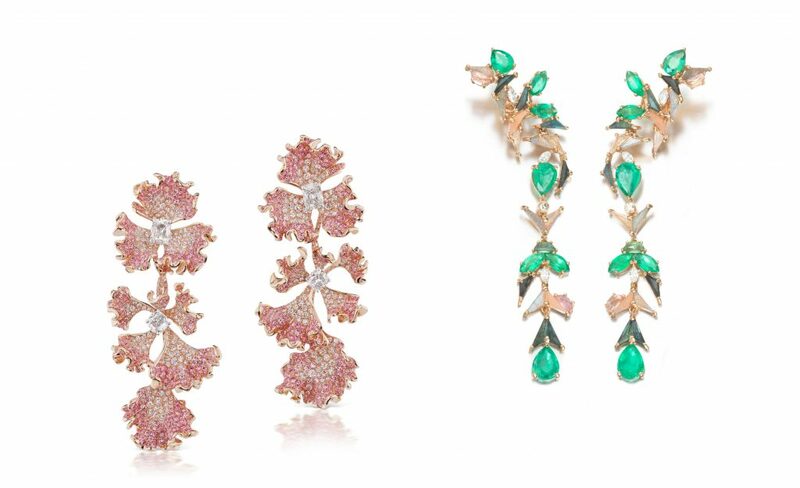 Nak Armstrong comes up with his own spin on tropical inspirations with his Fauna earrings. The signature stained-glass-like aesthetic lends itself, quite dreamily, to various gem cuts used by Nak in his creations. Michal Kadar’s Python symmetrical gold drop earrings from the Second Skin collection is architectural and flexible. Meanwhile, Glenn Spiro presents a pair of stunning blue titanium and white gold diamond earrings, featuring old-cut and brilliant cut diamonds. From cuffs to rings, bracelets to earrings, circle motifs bring a geometric flair to fine jewellery. Using an aesthetic that is minimal and bold, Spinelli Kilcollin’s shape-shifting linked circles are key motifs in its hoops, bracelets, and stackable rings. Kimy Gringoire’s brand, Kim Mee Hye, is fast becoming a hot favourite on the jewellery scene. Gringoire used circle motif in her Foyer earrings, Intertwine line rings, and Reversible collection rings. “It is all about proportion, balance between both lines and curves,” says Gringoire. 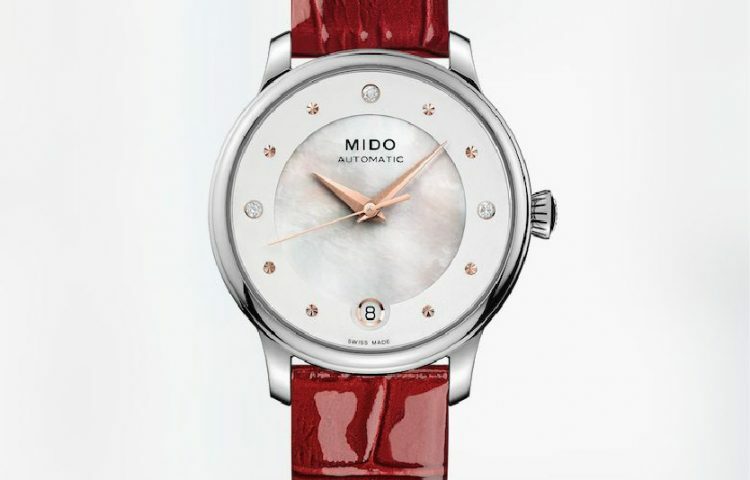 Clever mechanisms allow gem-studded circles to remain a secret, unveiled only at will. Circles are also a recurring motif in Moritz Glik’s works. He adds mesmerising details to his signature style by capturing diamonds and gemstones within sapphire crystal cases: free-moving gems create a kaleidoscopic effect in Moritz’s jewellery. Maria Canale and Polly Wales have used a stream of circles to form long drop earrings; while Nilufer Kizilkaya of GFG Jewellery created delicate wearables for the Muse x Gemfields collaboration. 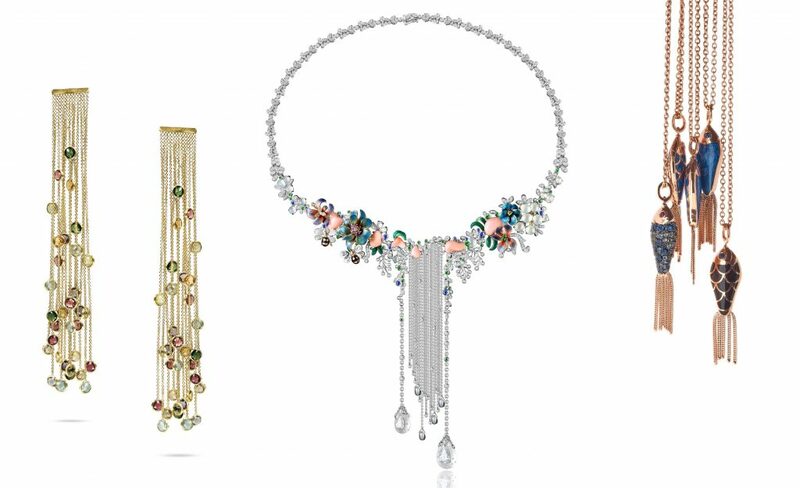 Taking inspiration from runway shows, designers have translated the fringe movement into fine jewellery. Selim Mouzannar surfaces with a handful of inspiration from the sea. His adorable enamel fish charm necklaces with swishing tails are worth snapping up. “The element of water plays an important role in many legends and myths. I wanted to translate it in a light and happy way,” says Selim. Shirley Zhang’s Tian necklace is embellished with enamel, diamond, jadeite, coral, and crystal. She has used link chains that flow down the centre of the necklace to evoke the majesty of a waterfall. Alessio Boschi’s Palio of Siena earrings flip open to reveal whimsical fringes studded with tiny diamonds and gold horses-riders. Brent Neale’s multi-gem Rainbow tassel earrings echo playful vibes of the ‘70s. Hueb’s earrings have fringes lined with diamonds; while coloured gems dance on link fringes in Marco Bicego’s earrings. Hoops were hugely popular last summer and continue to remain a sensation since. Cut-out shapes, textures, and enamel, dainty diamonds or coloured gem punctuations, and an occasional mix of metals add a touch of edge in the design. “The most important thing for a hoop is for it to be three dimensional — to present itself differently from various angles. If it does this well, then it can be exceptionally expressive for both the wearer and the designer,” says Vram. His gold Chrona hoops are eye-catching and their surface has been treated to resemble natural ageing. “We combine the different shapes, sizes, and colours of emeralds to match the sublime equilibrium of blue and green,” says Gargi Rathi, designer and founder, House of Meraki. Meraki’s Avocado hoops feature emeralds in princess cut, marquise, ovals and pear shapes. Alice Ciccolini’s exuberant Candy Kimono chevron hoops have gorgeous detailing that draws upon the Japanese tradition of containing patterns within circular forms. An array of pink-hued gems – meenakari beads and hand-carved stones – hangs playfully from the golden hoops.